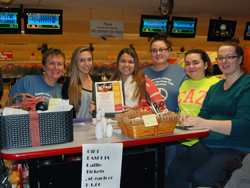 On Sunday, November 2, 2014, from 1-3 p.m. at the Cazenovia Bowling Alley Cazenovia College students took to the lanes, in teams of four, to raise funds for Madison County's Community Action Partnership (CAP). The students' efforts are in support of the well-being and safety of children, families and our community. This event was sponsored by the Cazenovia College Human Services Club. Over 60 student bowlers participated and an anticipated 24 teams were expected to take part in the fundraiser. Food donations for the CAP food pantry were accepted throughout the afternoon. CAP is a non-profit private agency that improves the well-being and safety of children, families and our community. The proceeds of this event will allow CAP to continue building resiliency in families, individuals and the community through their 13 programs relating to needs of housing, food insecurity, family stability, parenting, mentoring, medical, educational and socialization – all cornerstones of a healthy community. Established in 1983, CAP is the only not-for-profit, non-governmental agency in Madison County with a mission to serve the low-income community. CAP serves individuals, families, and the community through a variety of programs. For more information about CAP programs visit www.capmadco.org or call 315-684-3144.